Vol. 8, No. 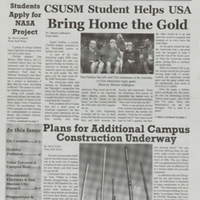 10 is a special political edition as well as covering Dan Guillou, CSUSM student and paralympic athelete, Arts and Sciences buildings construction, Day of the Dead customs, and student applicants to a NASA project. Vol. 9, No. 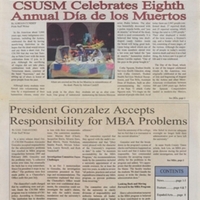 11 of the Pride features reports on the campus job fair, the Ethnic Studies Program and the Dia de los Muertos/Day of the Dead celebrations on campus. 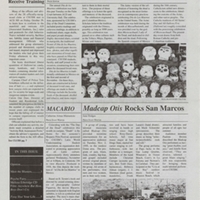 Events of the week - films, bands, training, and Dia de los Muertos are featured in the Vol. 7, No. 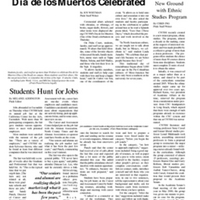 11 edition of The Pride. In the Vol. 3, No. 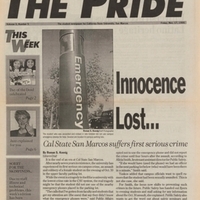 5 of The Pride, the cover story reports the first serious crime on campus.